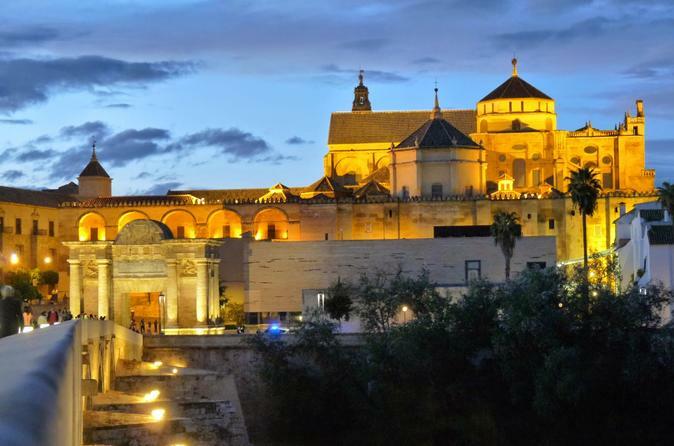 Go on this day trip to Cordoba from Madrid by a high speed train to discover the oldest and most impressive mosque in Europe. You will take the AVE train and delve deep in the art and architecture of Al-Andalus and the Mosque-Cathedral of Cordoba with a guide. You will have free time to discover the city at your leisure. Roundtrip train ticket is included. This adventure starts at 7:20am at Madrid Atocha train station where you will take the High Speed train to Córdoba Central. Remember, you will receive the electronic tickets after the booking process in your emails. Please bring them and show them at the entrance. When you arrive to Córdoba, you will go on a short walk to the city center. You will meet your guide at 10am at Puerta del Perdon next to the Mosque to start your complete guided tour. Please arrive 15 minutes in advance with your tickets. During your visit you will get explanations of the history of this UNESCO World heritage site. The guide will present you information of Patio de los Naranjos, the Mosque and its extensions, the amazing Quibla wall and the Cathedral treasure. After this 90-minute guided tour, you will be served with typical "tapa" and drinks and then you have free time to discover the city at your leisure. Your guide will give you advice to walk around The Calleja de las Flores, the Jewish quarter where you will discover a lot of treasures in Córdoba. Make sure you don´t miss the return train. The train departs at 8:01 pm (Tuesday and Wednesday) or 8:29 pm (Thursday and Friday) from Cordoba Central Station back to Madrid.